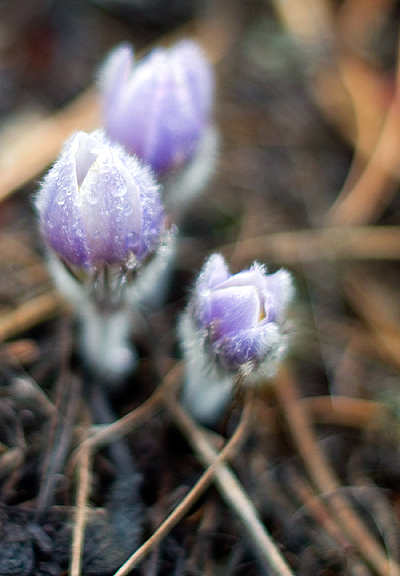 Flowers are EVERYWHERE. At first, I had a few lying around the house after a shoot (they were props). That’s about the only time we have flowers in the house. Our guests typically bring hostess gifts of food or wine, and Jeremy knows I’d rather we spend money on skis or outdoor gear over cut flowers any day. 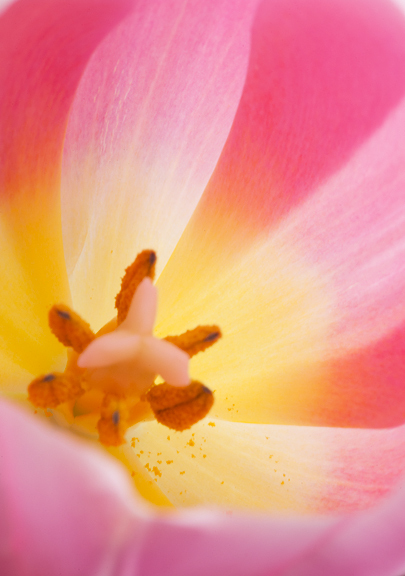 But if flowers are around, I love to study them: their structure, colors, shapes, flesh of the petals and leaves, the pollen, the geometries… Flowers are fascinating to me. And they’re lovely. Of course, it’s snowing this morning and I feel like someone has put the world back on the right track. That’s a short-lived burst of joy for me as we are reverting back to warm (hot) and sunny weather within 48 hours. I’m obsessing a bit over how to combat the heat and recalled how I cooled off when I was last on the Big Island of Hawai’i: liliko’i iced tea. Liliko’i is passion fruit and it is one of my favorite fruits on the planet. My mouth waters just thinking of the tart and fragrant pulp. Now, I’m not talking about making iced tea with Tazo’s passion tea (which I think is disgusting and tastes nothing of passion fruit). No, this liliko’i iced tea is like an Arnold Palmer (my default summer beverage). Rather than half iced tea and half lemonade, it is half iced tea and half passion fruit juice. Yes, and yes again. The ingredient list is short, but the sourcing can be difficult. 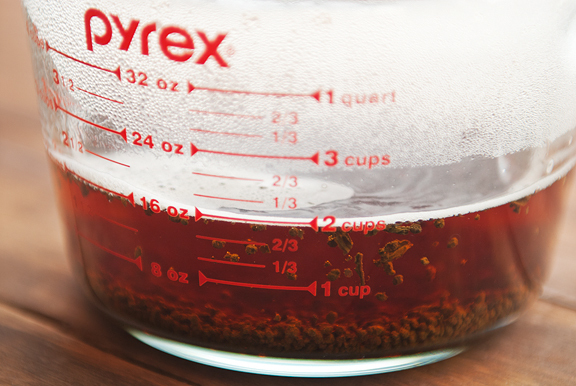 Let’s start with the easiest one – simple syrup. In most cases you will want to sweeten the passion fruit juice because it is tart. You can either add sugar or make a simple syrup. 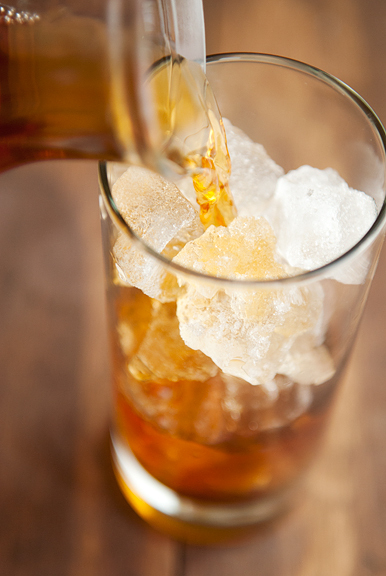 I prefer the simple syrup because it incorporates faster and we always have it in our refrigerator for mixing cocktails. Then you want to pick a tea. It can be a black tea, a green tea, whatever you like. I think an orange pekoe would work well for this, but I used a lovely Atlas Assam black tea from Atlas Purveyors. And finally, you need passion fruit juice. 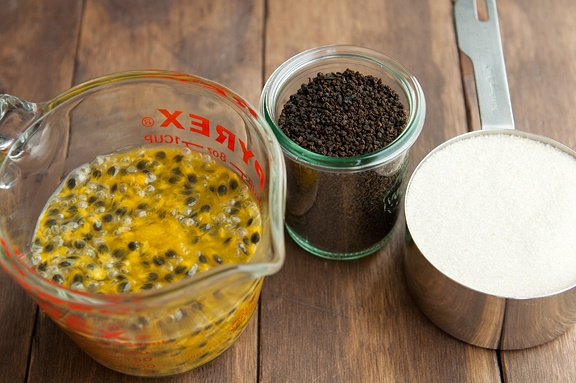 I make passion fruit juice in one of two ways: from concentrated purée or from the fruit. If you make your juice from concentrate, follow the instructions on the label. 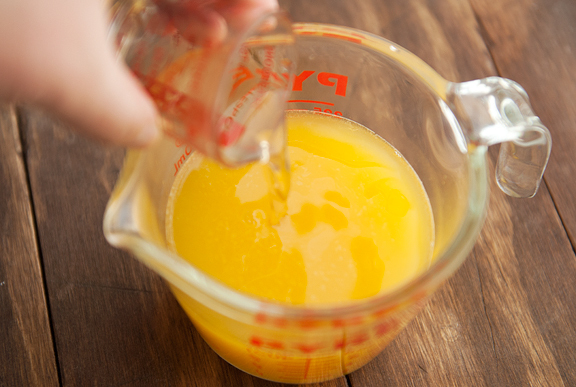 If you make it fresh, strain the juice from the pulp using a sieve, add water, stir in simple syrup (or sugar) to taste. I buy my concentrated purée (a brand called Perfect Purée) whenever I’m in California near a Draeger’s. I usually hoard them in my freezer. I source my fresh passion fruit from California too (at $3 per passion fruit in Colorado – I could almost buy airfare to California) by either raiding the fruit markets of Little Saigon in Southern California or receiving generous harvests from my dear friends Todd and Diane. I treat these fruits like gold, scooping out every drop of pulp, divvying them into 1 cup portions and popping them in the freezer. I hoard those too. I am totally ready for the zombie apocalypse. Totally. I think 6-8 passion fruits will give you about a cup of passion fruit pulp. It obviously depends on the size of the fruit. I was able to squish 2/3 cup of juice from a cup of the pulp. To that I added 1 1/2 cups of water and just over 1/4 cup of simple syrup to make my passion fruit juice (final yield of just over 2 cups). The rest is easy. 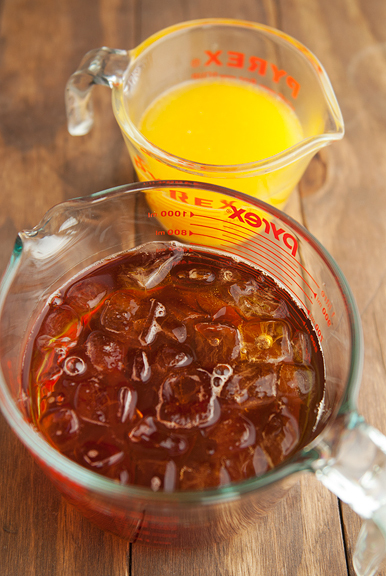 Fill a glass with ice, pour in your iced brewed tea to the halfway mark (or whatever ratio you prefer). Then fill the rest of the glass with your passion fruit juice. I think of it as my exotic alternative to the Arnold Palmer. When it gets hot, this will keep the cranky at bay. 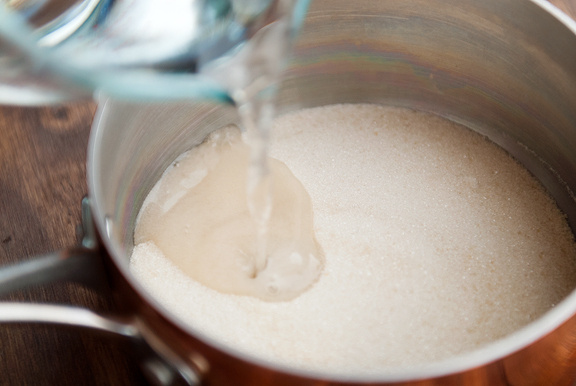 * To make simple syrup: combine 1 cup sugar and 1 cup water in a saucepan and stir over high heat until the sugar is dissolved. Bring to a boil and let boil for a minute. Remove from heat and let cool. Makes 1 3/4 cups. Steep 4 teaspoons of tea in 2 cups of boiling water for 2-3 minutes. Strain the tea leaves out or remove the tea bags. Add 2 cups of ice to the tea and set aside. 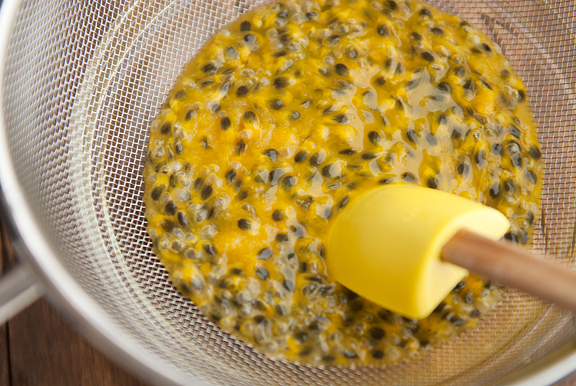 Press the passion fruit pulp through a sieve with a silicone spatula to extract as much juice as possible. Discard the seeds. 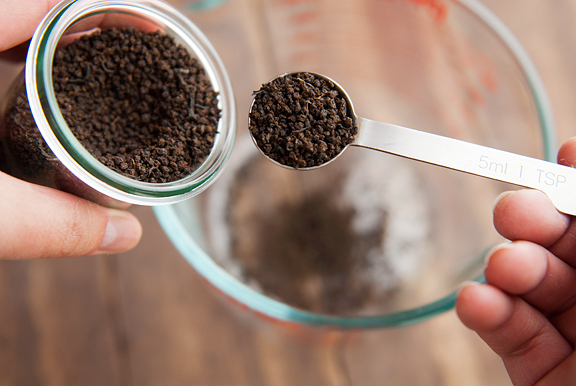 (If you don’t mind seeds, you can leave them in, just make sure the beat the pulp with a whisk to separate the juice from the seeds as much as you can.) You should have a juice yield of about 2/3 cup. Stir the juice into 1 1/2 cups of water. Add sugar or simple syrup to taste. Fill a glass with ice and pour the tea into the glass until it is half full. Top off with the passion fruit drink. Serves 4-6. That looks incredibly tasty! I love love love sweet tea, and now I think I need to start hunting for some passion fruit. Thanks! I looove passion fruit as well – I was elated when I discovered that Chobani greek yogurt actually has a Passion fruit flavor, but I wasn’t expecting much. But that yogurt flavor actually has curd in the bottom WITH SEEDS and it tastes fantastic! Not at all fakey-sugary yogurt which I hate. I love whenever you post passion fruit stuff. I gotta get me some of this. 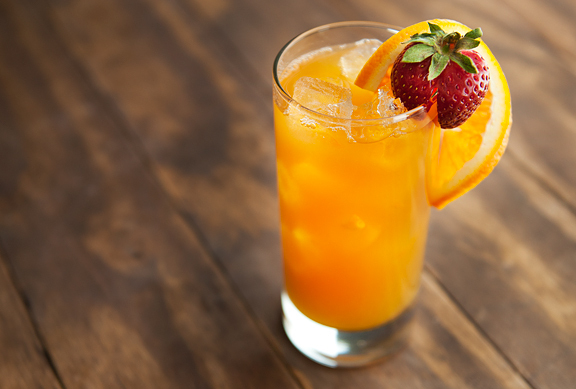 That last shot looks soooo refreshing :) I need to start playing around with passion fruit a bit more. I’ve seen them at the farmer’s markets but usually walk right by. What a lovely idea! Such a pretty drink. liquid gold, pure delight, 4sure! 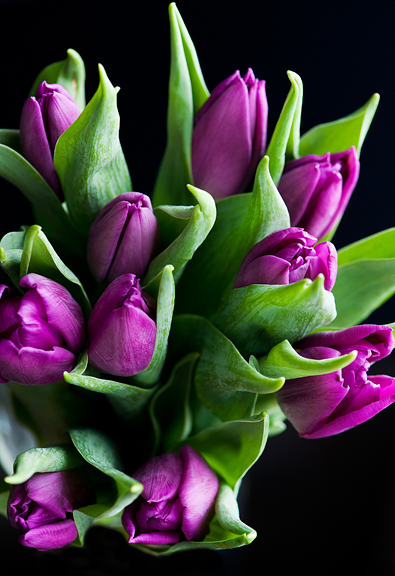 mmmm…you may prefer bolder colors, but those pink tulips with the black background are stunning! I love passion fruit…The flavor is truly refreshing. This I have to try! 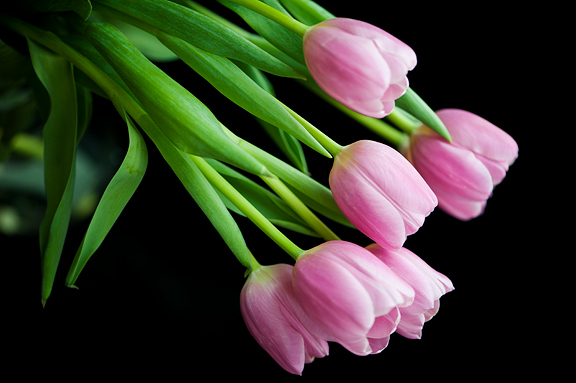 The photos of the tulips are so beautiful. I prefer the bolder colors as well! 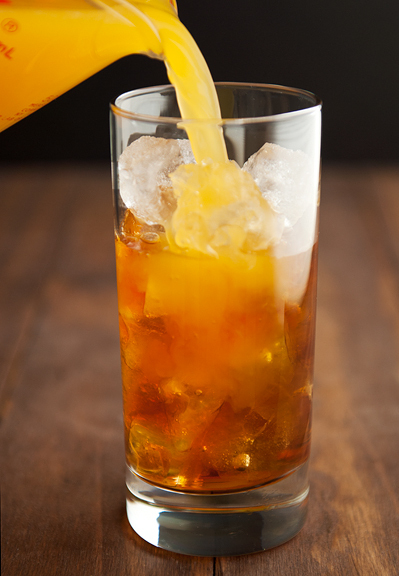 Your iced tea looks amazing! Such beautiful photos!! Especially the last one, lovely! It is made with a hibiscus base, so that is the intended flavor. “Passion” refers, I assume, to the emotion, not the fruit. As a corollary, their chamomile offering is named “calm”. Ashley – it’s a neat twist on a favorite, for sure. Allie – I love passion fruit anything, but it can be hard to get my hands on the stuff around here! Kristin – glad you like them! myfudo – hope you enjoy it. It became a fast favorite for me! wend – passion fruit is one of the ingredients, but yes – the reason I point out it isn’t Passion from Tazo is because people think that passion iced tea is the Tazo passion tea on ice – which it isn’t. I love these ideas, I was under the impression that I could slide the leaves off of the vines and dry them or not and put them in a ” tea ball” and let it steep, I also add spearment leaves and sometimes a purchased green tea or chamomile bag. Am I doing o.k.? Help appreciated. I love this recipe!!!!! looks so good.